Living as a teenage girl is hard enough for middle schoolers. Living a godly life is even more difficult! It helps to learn from someplace other than culture and media. You can help show young girls how to live as godly young women. 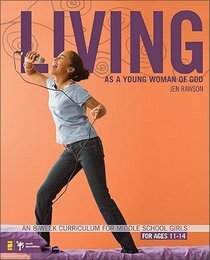 Becoming...book 2 is an eight-week study that will show girls how to live as godly women in the midst of the everyday life issues they face. With games, activities, quizzes, projects and crafts, movie clips, music, and stories, you'll have your girls engaged in a study that will help them figure out how to live life as the women of God they are. In this study, your small group of middle school girls will: * know who they are, and what they're capable of * learn to deal with pain and disappointment * grow spiritually * discover how to deal with friends, guys, and parents * find out how to become a woman of God Walk with your middle school girls as they discover what it looks like to live as godly young women. About "Living as a Young Woman of God"
Jen Rawson is a junior high coach, and has a bachelor's degree in biblical literature and psychology. She's been working with junior high girls for over a decade, and is passionate about helping young girls walk the path to discovering God's plan for their lives. She currently lives in Valley Center, Kansas, with her husband, Ken, and their wonderful children.